One of the problems folks face when trying to eat healthier is finding the time to wash, clean, and prep fresh produce. Not only is washing lettuce and greens time consuming, the entire process is a bit inconvenient. They need to be rinsed, spread out on paper towels, then patted dry with more towels… and no matter how much patting you do, they never seem to get dry enough. And all of this makes it much easier to choose something quicker to eat, but not necessarily as healthy. This is where a salad spinner can be a big help. 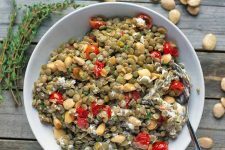 Even when time is tight, you can quickly make a fresh, nutritious salad. Just toss some leaves into the basket, rinse with cold water, then give it a few turns to spin dry. In just a couple of minutes, your berries, herbs, and garden greens are clean and dry – it doesn’t get easier than this! 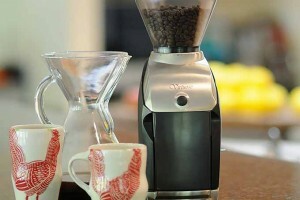 OXO makes some great kitchenware gadgets that really go the extra step in user-friendly design and quality components. 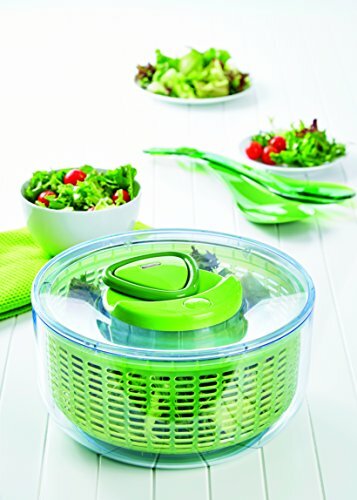 And the OXO Steel Salad Spinner is a good example of just that, as our favorite model for heavy, daily use. The patented pump mechanism gives easy, one-handed operation with a large plunger made of a soft, non-slip polymer. A few pumps with your palm easily engages the gears and quickly expels excess water. Then it neatly locks into the down position for a smaller storage profile. The brake mechanism is patented as well. A push of the large, soft button stops the basket on a dime, shaking off the last few drops of water and fluffing the greens from the fast stop. A clear acrylic lid allows you to watch the action. And here’s a feature we really love: the two lid sections easily come apart for cleaning – unlike most models on the market. And if you’ve ever dropped a clear acrylic bowl onto a tile floor only to watch it crack or shatter, you’ll love this large stainless steel bowl! Made of food-grade stainless steel, it’s lightweight but sturdy, has a non-slip base that keeps it stable, it won’t break when dropped, and it also makes a handsome serving bowl. 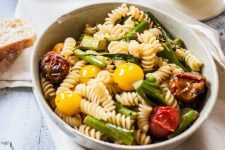 The slotted sieve is made of BPA-free plastic and is sturdy enough to be used as a colander as well – even with hot foods like pasta or steamed veggies, it won’t warp or lose its shape. All parts are dishwasher safe on the top rack and it measures 10.5 x 10.5 x 7.5 inches. Another great feature is the guarantee – it comes with OXO’s limited lifetime warranty to repair or replace faulty materials or workmanship. 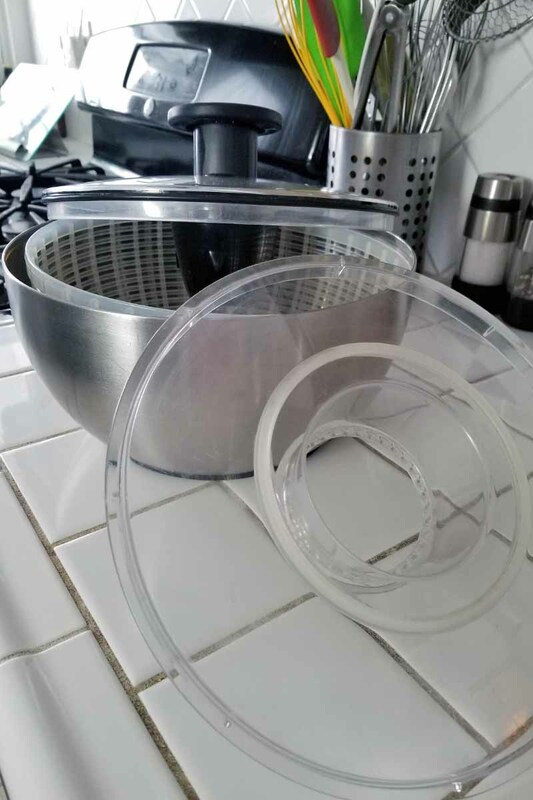 We love the OXO stainless steel spinner for several reasons: The stainless steel bowl is virtually unbreakable, the lid separates easily for thorough cleaning, and the reliably efficient pump produces an intense centrifugal force for fast drying. Add the lifetime warranty and OXO’s reliable customer service, and you’ve got a top-notch product that gives excellent value for the price! Available on Amazon.com, you can check current prices here. 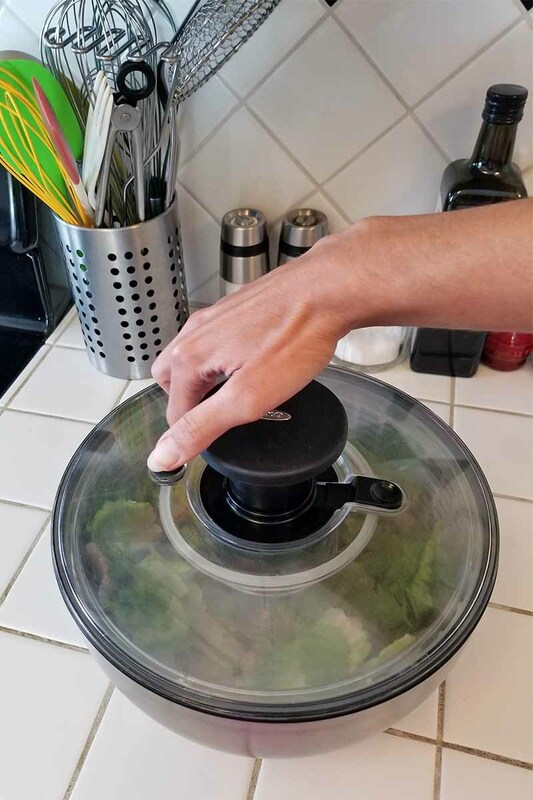 Cuisinart makes a no-frills salad spinner that offers economical value with an efficient action to wash and spin-dry lettuce, greens, and more. The large 5-quart sieve is lightweight and flexible, and effectively strains moisture away from the greens. 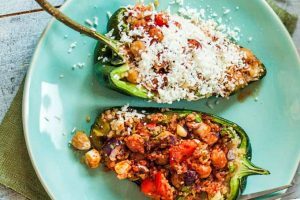 And it can also be used as a colander for room-temperature or cool ingredients. A large lid-mounted knob is comfortable to grasp, and makes it easy to crank the basket to full speed with just a couple of turns. For convenience, the lid has a large port opposite the knob to add water and a slotted beak for draining water – all without removing the lid. Two handy clips lock the lid to the exterior bowl to keep it securely in place when in use. The clear acrylic bowl has a non-slip ring on the base for added stability, and it can be used as a serving bowl as well. Handwashing is recommended for the lightweight materials. It measures approximately 10 x 10 x 7 inches and comes with Cuisinart’s 5-year warranty against defects in materials and workmanship. Efficient, user-friendly design and a budget-friendly price make the Cuisinart highly rated with online shoppers. Basic in design, it provides good value for moderate use. Check current prices now on Wayfair. 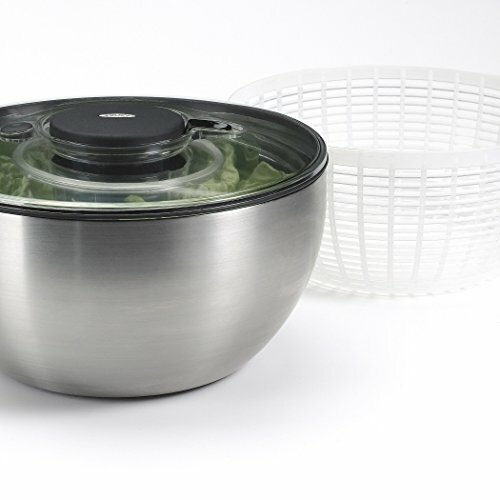 Culina’s large, 5-quart salad spinner is constructed of robust, quality components and food safe, BPA-free plastic. The side crank handle has a large, non-slip grip with plenty of knuckle clearance and quickly produces a fast centrifugal force. Comfortable and easy to turn, it can also be removed for cleanup, and for a more compact storage profile. The slotted sieve has a unique cross pattern to better extrude water, and it adds strength as well, making it suitable as a colander for hot or cold foods. The attractive clear acrylic bowl doubles nicely as a serving bowl. The tightly fitted lid has a large brake button opposite the crank that stops the basket almost instantly. Plus, four non-slip rubber feet keep the Culina securely in place, and prevent travelling. It measures approximately 9 x 10.5 x 10 inches and comes in a smaller 3-quart size as well. Dishwasher safe on the top rack, it comes with a 90-day return policy. 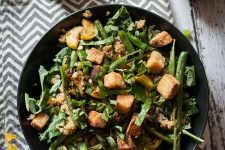 Sturdy and well built, the Culina does a nice job of removing excess water from greens, and the colander is one of the best. We also like the smooth action of the side crank. Efficient and affordable, the Culina is a worthy choice for daily use. The Culina is available on Amazon.com, and you can read customer reviews and check current prices here. 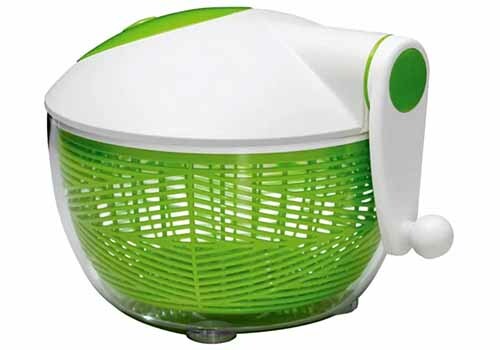 The Leifheit Salad Spinner is another model that gives outstanding durability with a stainless steel bowl, stcyled with an eye-catching design. The refined drying mechanism uses an alternating spin that rotates the sieve left and right in a stable motion, to effectively expel water. Activated with a cable pull, just a few tugs on the comfortable loop handle are enough to effectively and gently dry greens. The self-winding drawstring retracts quickly and neatly, and the handle nests into the lid for a tidy storage profile. 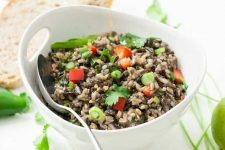 The attractive stainless steel bowl provides outstanding durability that won’t break when dropped, the wide silicone base gives excellent anti-slip stability, and it makes an attractive serving dish. Both the lid and sieve are made of food-safe plastic free of BPAs. The heat-resistant slotted sieve sits securely on a pivot pin and easily maintains a balanced load, and it can be used as a colander for draining hot foods like pasta or steamed veggies. The lid also features an integrated pouring beak so you can drain water without having to remove it. All parts are dishwasher safe for easy cleanup, and it measures approximately 7 x 11 x 11 inches. It comes with Leifheit’s 5-year warranty to be free of defects in materials or workmanship. 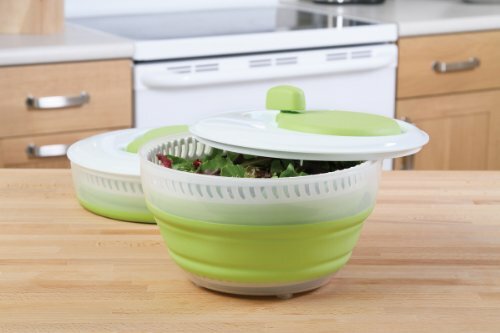 Durable and effective, the Leifheit salad spinner is robust enough for daily use. Easy to clean and operate, it also features attractive aesthetics and a sound warranty for added value. The OXO Good Grips with an acrylic bowl, and made of BPA-free plastics, is another kitchen favorite that boasts many of the same features that make their stainless steel version our top choice. With the same convenience and versatility, it offers easy one-handed operation courtesy of the patented pump mechanism. 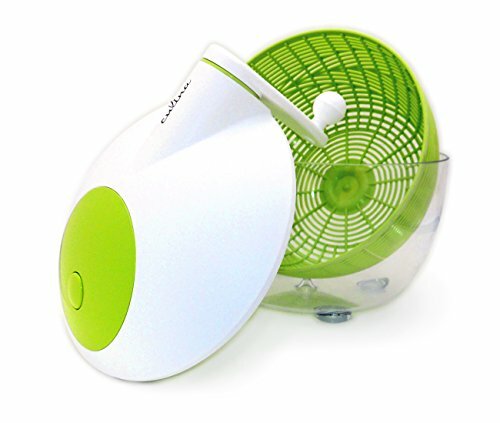 Gears engage effortlessly and create ample spin for drying delicate berries, greens, herbs, lettuce, and other veggies. The lever is operated using the large and comfortable non-slip knob made of soft white plastic. A few pumps generate all the force needed to quickly discharge moisture. Basket rotation comes to a quick stop with the lid-mounted brake button, which nicely flings the last bit of moisture from greens. A sliding lock holds the transparent lid securely in place, and a non-slip ring on the wide bowl base keeps it steady while in use. The two-piece lid pops apart easily for complete cleaning, and the pump locks flat for a convenient, compact storage profile. The white slotted basket can be used separately as a colander for hot or cold foods, and the clear bowl is sturdy enough to be used as a serving dish. All components are food safe and made of BPA-free plastic. If you prefer, this model is also available in green. The Good Grips is safe on the top rack of the dishwasher. It measures 10.5 x 10.5 x 7 inches and comes with OXO’s limited lifetime warranty to be free of defects in materials or workmanship. Engineered for high-volume use, the OXO Good Grips uses durable materials, sturdy construction, and a user-friendly design for reliable performance and simple operation. Plus, the lifetime guarantee gives great value for this mid-priced model. The OXO Good Grips is available on Amazon.com, and you can check prices here. 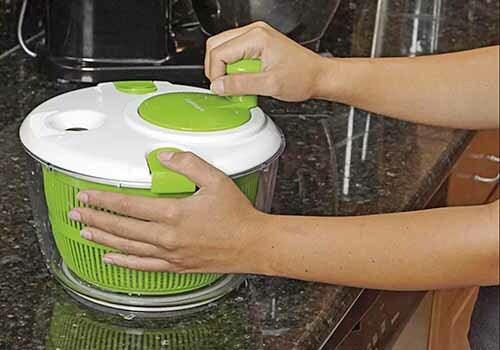 The large, 5-quart Starfrit spinner offers sturdy components and a convenient side handle for a fast centrifugal force that quickly expels excess water for dry, clean greens. The side crank handle has a large, comfortable knob designed to provide plenty of knuckle clearance for easy rotation. A smooth flywheel quickly turns the basket to top speed with just a few cranks, and a large lid-mounted brake button gives an immediate stop. The slotted sieve uses a unique pattern that adds strength and stability to a full load, and can also be used as a colander. The transparent acrylic bowl is suitable to use as a serving dish. And it has four rubber feet that provide a secure, non-slip purchase, preventing countertop travel. Handwashing is recommended. The Starfrit measures approximately 11.5 x 8.5 x 11 inches, and it comes with a 1-year warranty. Solid and dependable, you can count on the Starfrit for quality materials and reliable performance. This is another good choice for repetitive, everyday use. Available from Wayfair, check prices here. Winner of the prestigious European Red Dot Award for innovative design, the Zyliss 5-quart spinner features simple operation, reliable performance, and sturdy components made of food safe, BPA-free plastic. The new and improved easy-pull cord is self-retracting and designed with a large loop handle for a comfortable, secure grip. With a couple of easy pulls, it smoothly powers an innovative glide wheel for fast, consistent rotation that speedily dries greens. The cord and handle fit neatly into the transparent lid, which sits low and snug in the bowl and gives a convenient flat-top, compact profile for storage. This also makes it suitable to store greens in the fridge. The slotted basket comes to a prompt stop with a push of the soft brake button, and the swift halt in action gives the greens a nice fluff as well. 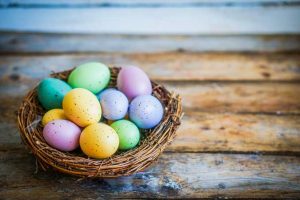 The basket can be used as a lightweight colander for cool foods, but hot liquids should be avoided. The rigid, transparent acrylic bowl has a non-slip base for stability, and can also be used as a serving dish. The bowl is dishwasher safe on the top tray, but hand washing is recommended for the lid. The Zyliss measures 10 x 10 x 5.5 inches and is available in white or green. A smaller, 3-quart version is also available, and both come with a 5-year warranty to be free of defects in materials or workmanship. Designed to delight, the Zyliss Easy Spin gives trouble-free performance in a compact, tidy profile. 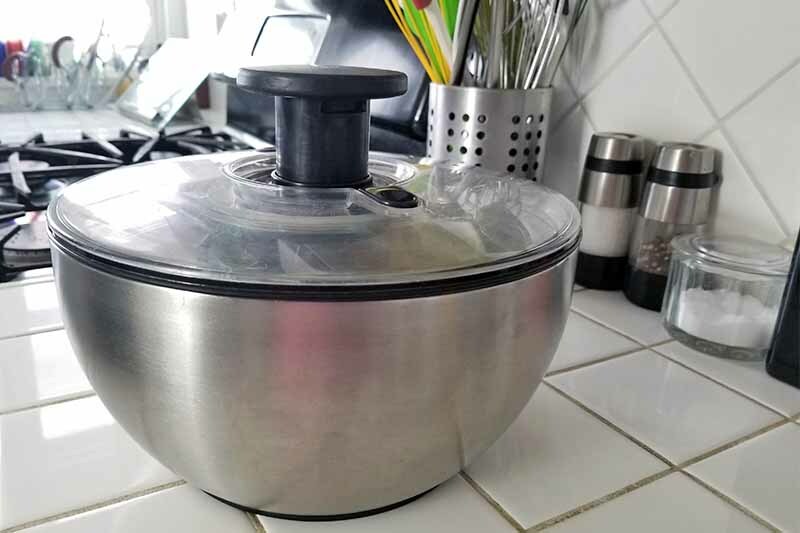 An excellent space saver that’s user friendly and lightweight, operation is simple with this model..
Hullr makes a popular, 4-quart family-sized spinner that gets a lot of love for its innovative design and efficient drying action on berries, herbs, salad greens, and other veggies. 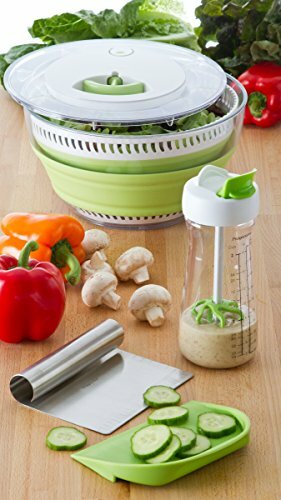 Constructed of BPA-free plastic, it features a large, comfortable lid-mounted crank with a small shaft that gives elevation for extra knuckle clearance – and it can be spun in either direction for excellent drying. A handy brake button quickly stops the basket, and when not in use, the lid can be inverted to nest in the bowl for a smaller, tidy storage footprint. 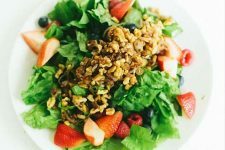 A combination water/salad dressing port allows you to add water for rinsing greens, or you can add your favorite dressing without ever having to remove the lid. The slotted beak opposite the handle can be used to drain water cleanly away from the bowl. 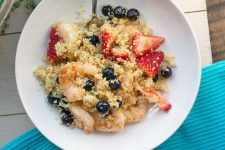 A flexible basket doubles as a colander for draining cool foods, and the clear acrylic bowl with its non-skid base can also be used as a serving bowl. The bowl is dishwasher safe on the top shelf, and the remaining components should be hand washed. It measures approximately 10 x 10 x 9 inches with a height of about 6.5 inches when the lid is inverted, and comes with Hullr’s extended warranty. Unfortunately, we were unable to pin down the details of this warranty. At the time of this writing, attempts to contact customer service via phone and email were unsuccessful. Thoughtfully designed and a pleasure to use, the Hullr is deservedly popular. The cranked gears engage immediately for a fast spinning action and its sturdy components ensure a long life, giving good value for everyday use. Read more reviews and check current prices now on Amazon. 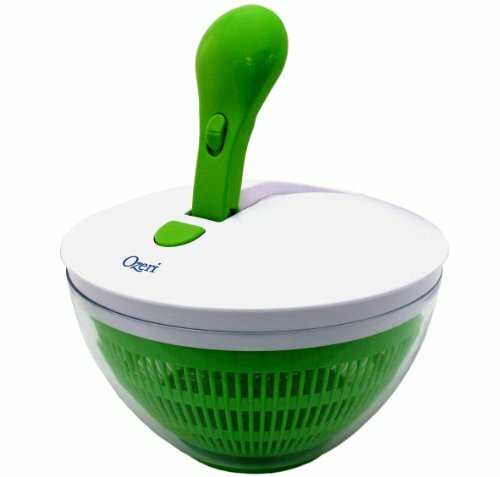 The Ozeri Freshspin has a mid-size capacity of 4 quarts, and is designed with food-safe plastics. 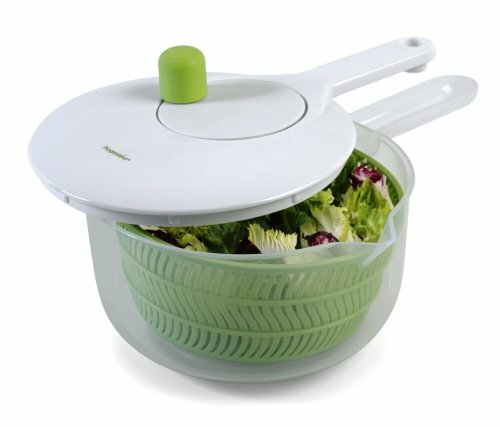 The large lever provides an easy, frictionless action with no cords to fray that quickly dries herbs, lettuce, salad greens, and more. The ergonomic lever requires only 2 or 3 pumps for maximum velocity, and locks into the lid for storage when not in use. And a large, lid-mounted button brakes quickly to stop the colander’s rotation. All parts are constructed of food quality, BPA-free plastic and are of a strong, durable nature. The slotted basket has sturdy spines and can be used as a colander for hot or cold liquids and foods. And the clear base with its non-slip bottom easily doubles as a serving bowl. Hand washing of all parts is recommended. Dimensions are approximately 11 x 7.5 x 11 inches, and it comes with a 2-year warranty. We like the Ozeri Freshspin because of its reliable, frictionless lever and the durable materials, but the heavy lid and narrow bottom make it a touch top heavy. We didn’t find that to be a deal breaker, considering its effective drying performance. Read customer reviews and check current prices now on Amazon. Progressive makes a collapsible model that’s the perfect solution for small kitchens or any location with limited storage space like dorm rooms, the cabin, campers, RVs, and boats. This 3-quart model is made of BPA-free plastic, and both the colander and bowl collapse to half their size for compact storage. A slotted inner basket provides plenty of stability for large loads and can be used as a colander, and the exterior bowl can double as a serving dish as well. The large, comfortable handle easily rotates the flywheel with a smooth action and can be spun in either direction. When finished, it neatly folds flat with the lid for convenient storage. To stop the basket, simply squeeze the sides for quick and easy braking. Four feet are treated with a non-skid base to provide stability, keeping the bowl in place when in use. Dishwasher safe on the top rack, the full size measures approximately 10 x 6 x 10 inches and it collapses down to a height of 3 inches. And it comes with Progressive’s satisfaction guarantee to be free of defects in materials and workmanship. If you’re looking for something a little larger that is also collapsible, a 4-quart model is also available, with a slightly different design. 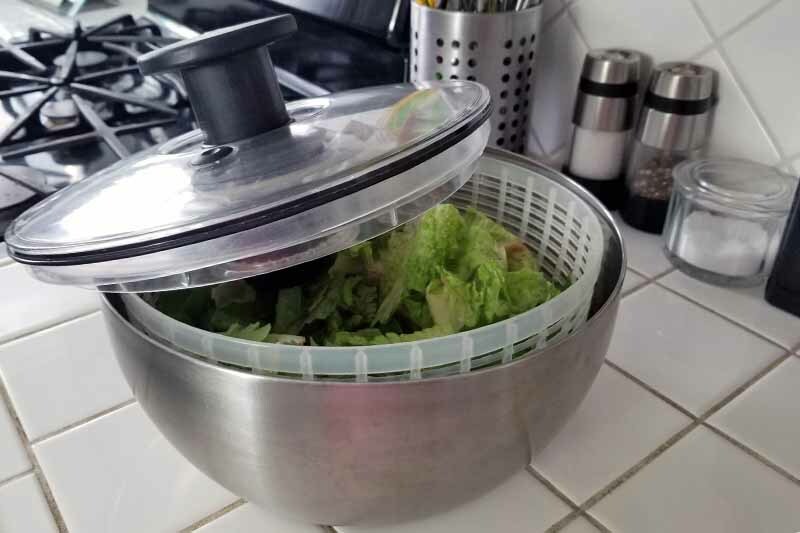 This is an innovative solution for washing salad greens, without the bulky storage problem that a large spinner presents. Functional, efficient, and easy to use, it’s a great option for vacation accommodations or small kitchens. The Progressive 3-quart is available on Amazon. Check prices and read customer reviews now! 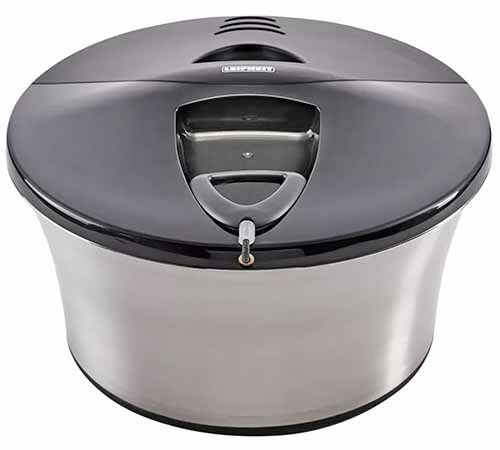 Another model from Prepworks by Progressive, this is a smaller salad dryer with a 2.5-quart capacity that makes it ideal for prepping a single large salad, or 2-3 side salads at a time. Made of food-safe BPA-free plastic, here’s what makes it unique: this tiny wonder is designed with a long stick handle for easier control while cranking the basket. And the lid section of the handle snaps in place with the bowl to prevent it from coming off when in use. It also features convenient pour spouts on either side of the bowl that make it suitable for left- or right-handed users, and the basket can be used as a standalone colander for draining cool foods and liquids. The large knob is designed for a comfortable, non-slip grip, and it quickly whips the basket to top speed for a powerful centrifugal force. As the basket can be spun in either direction, it’s very effective at expelling water. Dishwasher safe on the top rack, it measures approximately 11.5 x 9 x 6 inches, and comes with Progressive’s satisfaction guarantee to be free of defects in materials or construction. Sturdy and well-built, the Prepworks is handy for rinsing and drying small servings of berries, greens, and other vegetables. This option is best suited for singles, or those with kitchens that are low on storage space. Available on Amazon, you can check current prices here. Spinners first hit the market in the ‘70s, and unlike many trendy kitchen gadgets, soon proved their worth. 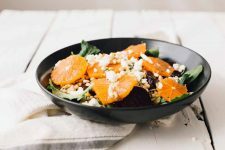 Their simple operation and efficacy at washing and drying lettuce and leafy greens proved popular with the home consumer, and that popularity continues today. These handy gadgets also help to extend the shelf life of tender greens. Lettuce in the produce department often gets a mist of water to help maintain a crisp appearance, but unfortunately, this excess water can also cause fast spoilage. When you get your produce home, give it a quick drying cycle in your spinner to remove excess water, then seal and store in the fridge for longer life. Components of this model come apart for easy cleaning. This high-quality spinner from OXO is more than 5 years old, and still going strong. 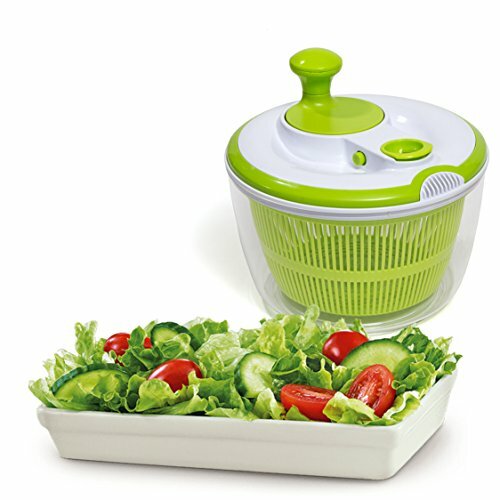 You can also use a spinner to dry pre-washed greens or to clean an entire head of lettuce, then store it in the fridge. It’ll be ready when you are for a crisp, refreshing meal. They’re also handy for rinsing and drying tender berries, herbs, or mushrooms without bruising and can be used for many fruits and vegetables. 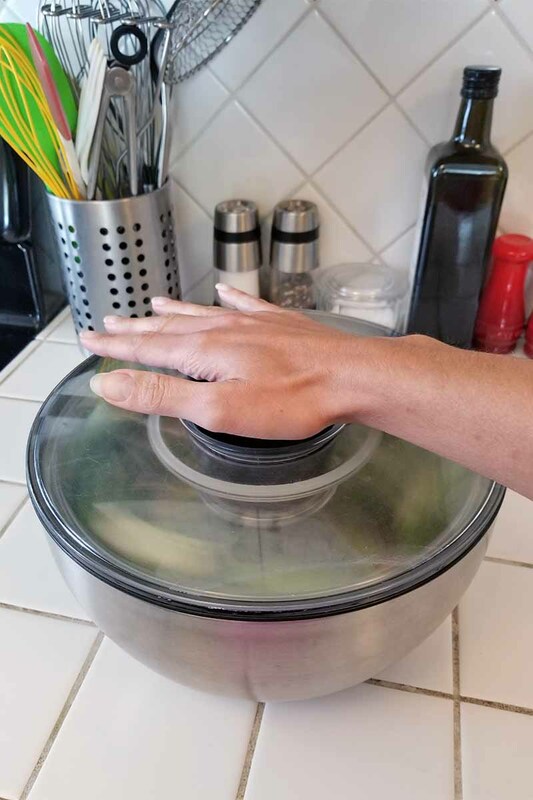 A good spinner makes salad time quick, efficient, and easy – which means you’re more likely to get all those wonderful natural nutrients necessary for good health every day! A slotted sieve or inner basket that rests on a pivot point for rotation. A larger exterior bowl that houses the basket with the pivot point in the center of the bowl’s bottom. A lid that holds the mechanism for grabbing and spinning the sieve. Moisture is expelled by a centrifugal force that pulls the lettuce to the edges of the basket, where water is extruded through the perforations and into the outer bowl for collection and disposal. Simply press on the top of this stainless steel OXO model to make the inner wheel spin. Older models often had perforations in the outer bowl to drain the water away, but they couldn’t do double duty as serving bowls. Today, the more popular solid outer receptacle makes this gadget an even more convenient and useful addition to the kitchen. The centrifugal force is initiated with either a hand crank, a plunger or pump lever, or a pull cord. A hand crank operates through a system of interlocking gears to generate speed, a plunger or lever uses a pump to engage the gears, and a pull cord uses friction to commence motion. If you’re in the market for a new spinner, use the following checklist to help narrow down which model is best suited for your needs. Select a size that will best suit the requirements of your family. Look for a unit with a tight-fitting lid to ensure proper engagement of the gear mechanism. On some units the centrifugal force can generate quite a bit of speed, and if the lid isn’t secure, flying lettuce may result! Look for easy-snap locks to hold the lid in place. 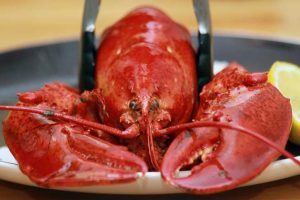 Food-safe plastic is so readily available in kitchen utensils today there’s really no reason to purchase any model that might contain harmful toxins. Designs like this one include a convenient brake button to stop the rotation of the inner bowl, and a locking lid for storage. Hand cranks take a bit more effort to work than push buttons or levers, but there may be a trade-off in how fast the colander rotates – and that determines, in large part, how dry the greens will be. Choose whatever style will work best to suit your personal preferences. 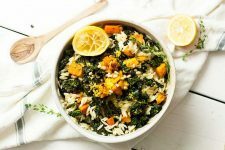 In many models, the outer bowl is designed to do double duty as a serving bowl, so look for this feature for added convenience – fewer dishes to wash, and built-in refrigerator storage! 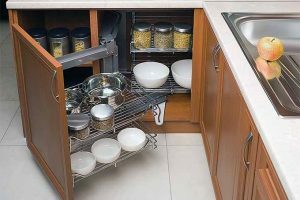 Most manufacturers advertise their products as being dishwasher safe on the top rack, but in our research we found several products that can warp from dishwasher heat. Hand washing is recommended when in doubt. Large models can be bulky and take up a lot of cupboard space. If this is an issue, consider smaller models, ones with nesting lids, or collapsible ones. Of the hundreds of salad spinners available in the marketplace, the 11 models listed above are among the best. 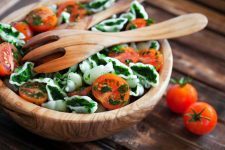 While the features and prices may vary, they all share the essential characteristics of easy operation, quality materials, and efficient spin-drying of leafy greens. 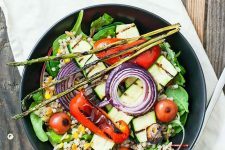 If you enjoy a healthy salad, or just want to eat more veggies, pick up one of these time-saving gadgets today – they’re wonderfully effective and well worth investing in! 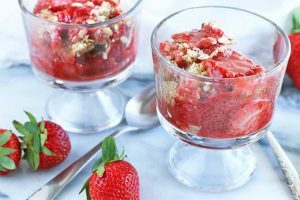 And if you’re looking for more smart appliances to save time and improve your cooking game, check out our guide to food processors – they’re the ultimate in convenience. Photos by Allison Sidhu, © Ask the Experts, LLC. ALL RIGHTS RESERVED. See our TOS for more details. Product photos via OXO, Cuisinart, Culina, LeifHeit, Starfrit, Zyliss, Hullr, Ozeri, and Progressive. Originally published on July 19, 2015. Last updated: February 11, 2019 at 19:02 pm. I ONLY buy my salads pre-washed because I find it’s a pain to wash and dry leafy greens, but that does limit my choices and as well I don’t 100% trust that they are washed properly. I got some extra Amazon $$ I might try one of these out! Great post saved me a lot of time that’s a few hours of good research. Thanks Lorna! Pre-washed salad greens is the way to go jony, but I like my spinner for berries, some home-grown greens in the summer, kale etc. – it’s actually pretty handy and gets used a lot. Glad you found the post helpful! I am one who loves eating salads. I do wait for the lettuce to drain, it just is important for it to be crispy. That makes this product appealing to me. I have thought of buying one before, but never invested any time in research. I didn’t think it was worth it. After reading this post, I see it is worth it. I really like the innovation and design of these models too. I like my appliances to also beautify my kitchen. It is one of those things where you can see the invention is really meant to help you out in the kitchen. For such a simple took, they’re very multi-functional in the kitchen aphil. And some do have cool design features as well as aesthetics. A friend recently got a great deal on a brand new Kitchen Aid Salad Spinner at a local thrift shop. I won’t be fortunate enough to stumble upon a similar deal, so I thought I’d read this review. 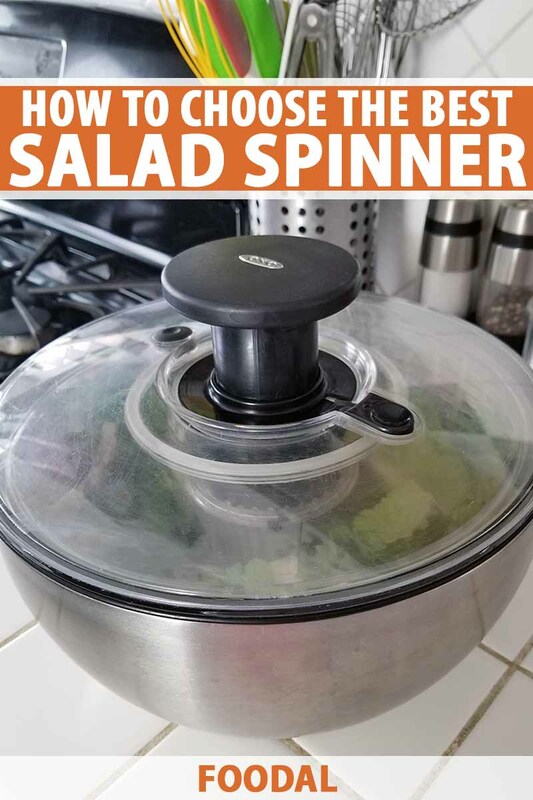 I was unaware there was such a variety of salad spinners, or that they functioned in different ways. I do like the looks and sounds of the OXO Good Grips spinner, and I often buy their products, but there are also a few others here I might consider. I couldn’t do wothout my salad spinner. It’s only a basic model but the spinner doubles as a serving bowl, which helps cut down on washing up. Without it, I just end up using masses of kitchen roll trying to get all the leaves dry. Spinners make light work of everything. Agreed mb, I received mine as a gift a number of years ago and they’re one of the best time, and paper towel, saving hacks in the kitchen. I never thought of using it as a serving bowl! Now that you mention it mine could be used as a serving bowl as well. Thanks for the tip. It’s horses for courses but I think most people have moved on from spinners. Stuff in store is a lot cleaner. But I suppose it might be a good gadget for a gardener. Personally I don’t mind a slightly damp salad either. Pre-washed is certainly more convenient, but much more expensive and spinners still seem to be selling well. I was always weirdly fascinated by salad spinners when I was a child, but I still don’t own one. And I feel like I waste so many paper towels trying to get all my veggies dry, so having one would be incredibly useful to me. I’ve also read that they have many other uses. I like the designs of quite a few of these, so I’d just need to narrow down which is best for my needs. Getting rid of the paper-towel-guilt alone is worth the price, and really quite useful if you eat a lot of raw fruits and veggies. I didn’t know that salad spinners came from the 70’s. I used to have a salad spinner in the past. It is nice to see that there are other models out there. The basic design hasn’t changed much since then, but compared to the original ones, today’s models are pretty sleek. I used to have the Zyliss but it got lost when I was moving apartments. I miss my salad spinner. Thanks for the reminder! So glad you looked into the many MANY brands of spinners that are out there. I have been gardening like a mad person as of late & I noticed that while I am spinning my herbs it’s especially difficult to get at all the grit & dirt. I have the OXO brand & I think I might need to upgrade a tad. I have better luck with my lettuce but the herbs can get so frustrating. I think a little mini device with a fine mesh colander for herbs would be a great idea. As it stands, I wash and spin herbs still on the stem and strip the leaves after they’ve dried a bit – it seems to help. I used to laugh about salad spinners. I thought they had to be a totally worthless waste of space. One day my daughter bought one, and finally convinced me that they are an awesome kitchen aid. Now I wouldn’t want to be without one! 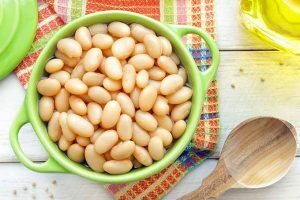 Great article about an underrated product. LOL! I used to think spinners were totally lame too. I probably still wouldn’t have one if I didn’t receive one as a gift… but you’re right icecat, a very underrated tool that I use for many purposes. This is so funny because I used to think the same thing. I’m very basic in the kitchen – not many gadgets. When I first heard about this tool I giggled and thought it would be a waste of money. Wow, was I wrong! Wet salads are definately a downer in my kitchen too littlefoodie…. glad the post found you when you needed it! To be perfectly honest the only thing I wash when prepping a salad is the tomatoes. I have never washed the lettuce I just assume it has been washed prior to being placed in cooler for purchase. I know people that wouldn’t think of eating lettuce without washing it. 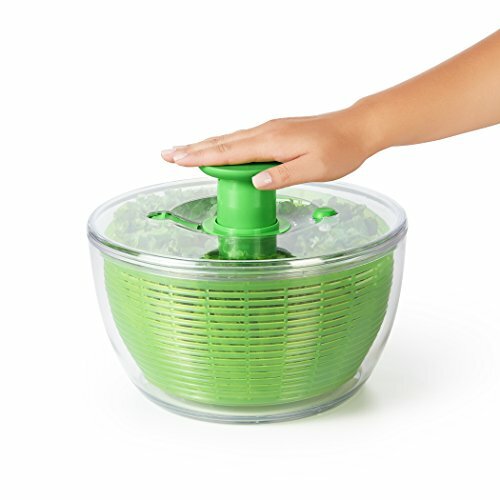 The salad spinners look really helpful for those that do in fact wash produce. Lettuce in clam shells is usually pre-washed, but other varieties only get a rinse from the sprayers in the cooler display. And they get handled a lot between the farm and grocery store as well. I’m 50 years old and I just discovered this awesome tool last summer of 2014. Really! Where have I been? I’m one of those people who didn’t eat many salads because I hated the prep time as mentioned. And I didn’t like wet lettuce! I was told about these handy gadgets on a popular weight loss site and fell in love with it. I purchased a large size tub so that I could make huge salads at one time. Recently, I discovered making salads in a jar. I wash all my goodies, spin, and then add them in a jar layer by layer. I make up about 5 jars with my favorite food items for the week. When it’s time to eat I just grab a jar, pour it in a large bowl, and then add my dressing. So convenient! 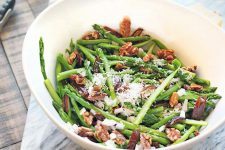 Spinners are perfect for many larger batches as you do Mama B, and a salad in a jar for the week is a great time saver. And at this time of year, mine gets a good workout rinsing berries as well – I dislike wet berries as much as wet lettuce! This was my kitchen task as a child in the 90’s that my mother would make me do. She had a hand-crank one and I do not ever remember it breaking. I don’t see her ever use it anymore, and I am sure she does not have that model any longer. There has been a small “anti-lettuce” movement developing because of its high water\low nutrient content, and the fact that it has to be shipped using fossil fuels and takes up valuable farm land. It does make sense even though I love lettuce. I have started to opt for other varieties of leafy greens like arugula and spinach which have more nutrients. I’m always worried about buying totally plastic products these days. It seems like everything that is made in Cina these days is designed to break. I usually wash pre-washed greens anyway just because. Lettuce still has a place in my salad bowl, although I’m like you and tend to lean more towards the ‘super greens’ these days HF. Might as well get the nutritional benefits too. And while it’s true that a lot of plastic products out of China are cheap and disposable, quality seems to depend on the manufacturer’s standards as well. Which is why we like to offer our readers guides where the research leg-work has been done, so they can make informed decisions. I have never actually used one of these devices at home. I used to have a very low level leadership position at a company that cut, washed and dried romaine to either package or use in salads. Since I was confident enough and how it was handled I would purchase the pre-cut lettuce at times. Other times I would gently blot dry the lettuce with clean towels or paper towels after washing. I may try a home spinner though. We spun romaine in a big machine to dry it where I used to work. Interesting behind the scenes insights nytegeek, thanks for your comments. I just read an article about prolonging the life of greens by washing and spinning them. Finding this article was perfect timing since I’m planning to buy one in the near future! Thank you for taking the time to research and compile the top options – you saved me so much work! I also really appreciate that you only included BPA free models! I haven’t decided which one I’ll get, but I feel much more confident about making a decision now! That’s great julabugg, so glad you found the post useful. Enjoy your new spinner! 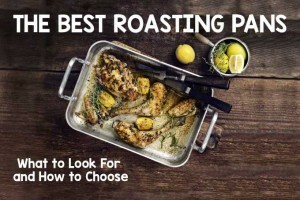 This is a really good guide to a wonderful appliance. It’s so funny. When Salad Spinners first came out, I remember people laughing at them, and calling them silly and useless. I even remember late night comedians making jokes about them! I was skeptical myself until a couple of years ago when my daughter bought one. She sings its praises and swears she’ll never be without one again! Needless to say, I have been won over. I’m going to study this guide, and decide which one I want. I remember the jokes icecat, think I made a few myself! I too was skeptical until gifted with one, and now it’s one of my kitchen ‘must-have’s’! Enjoy your new spinner! I eat a lot of salad, almost every day. But I don’t have a spinner. Is it really necessary? I’ve only heard of them in passing, and now I’m wondering if I should reconsider and invest, but I also worry the time it would save me drying wouldn’t be worth it to clean the spinner after. They’re not necessary TomiLee13, but very handy and convenient. I pooh-poohed them for years, but after using one, it’s now an essential part of my kitchen gear. Being somebody who normally spins my own salad, I found this to be a good idea. However, I’m still a bit on the fence about buying one. I’m pedantic about details and this is no more true than in making a salad. I feel like a salad spinner wouldn’t hold up to my standards, although I would save a lot of time? What do you think about it? Should I just get one and then fuss about the details later. Either way, I’m stilling having a lovely bowel of food! 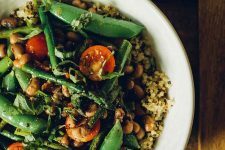 Some of them are surprisingly good Antonr, and versatile for much more than salad greens. I was a late comer to spinners, but glad I converted! I’ve gone thru two of the progressive salad spinners with the pull cord in less than 18 months. Stay away from the ones with a pull cord as they ultimately fray and break. Thanks for the tip Jason, good to know! 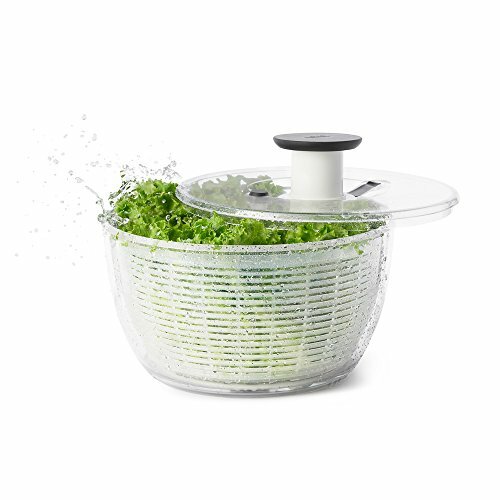 The single ESSENTIAL feature any salad spinner requires is a bowl/colander with straight sides, like a cylinder. The spinners with with a true “bowl”, that is curved sides, were designed by someone who clearly failed physics. The water is removed by centrifugal force, generated by the product of the distance from the spin axis and the speed at which it spins. A curved bowl has avery short distance from the axis to the wall at the bottom of the bowl, therefore less centrifugal force, and is less effective removing the water. So there! Maybe it is a good time to actually investigate the quality, durability, and longevity of these that you recommend…. I just checked your #1 OXO model on Amazon and there are WAY TOO MANY reports that this breaks without much use at all. Not a good buy for $48 if it fails after a couple of uses. Thanks for your comment, Rich. We do take comments from purchasers online into account, as well as firsthand testing. I’ve owned this salad spinner for over 5 years, and I vouch for its durability wholeheartedly! When used as directed and hand washed (I never clean mine in the dishwasher), I stand by it as a quality model from a trustworthy brand.